In mid-September of 1997 and with much fanfare, California Virtual University (CVU) opened its doors, launching a website which would feature "the online and distance education offerings of all California accredited colleges and universities." The following year, state governor Pete Wilson pushed for and won $16 million (all figures in US dollars) for online learning, and of that, six million for CVU in particular. "We'll have a global audience," said Diane Vines, vice president of academic development for the California State University Institute who served as CVU's chief academic officer for the design and planning phase. By April of 1999, the dream lay in ruins. All that will remain is a listing of online courses and programs offered by other California institutions. CVU's plans for an virtual library and online guidance counseling service were shelved. Staff were laid off. Last July, Wilson turned over the California Virtual University to a nonprofit foundation, saying there was "no need" to create a new state bureaucracy. He launched it with temporary funding from private donations, hoping it would soon be bringing in revenue from ads on its Web site at www.california.edu. But when Stanley A. Chodorow arrived as the virtual university's first CEO, he found it without any financial means of support. So he asked private colleges and the three public segments--the University of California, Cal State and community colleges--to collectively chip in $1 million a year for three years while he built up advertising and book-sales revenues. The colleges and universities balked, and CVU, with no money for its operations, folded up its tent, leaving only the directory. While on the one hand this is just another story of an unprofitable enterprise biting the dust, on the other hand it is a story of wider impact because CVU was seen in some quarters as a model for the future. The failure will affect online learning in general, and the reasons for the collapse attributed to weaknesses in the medium as a whole. The post mortem offered by the L.A. Times is unsatisfying. control and predation of 'mainline' business units. The first three 'reasons' cited in the article are implausible. None of these circumstances is unique to CVU. Online learning institutions around the world have worked on issues of access, credibility and instructor support with some degree of success. Certainly the proliferation of private for-profit institutions would not be possible were these insurmountable issues. Even as early as last year, Ted Marchese, in the American Association for Higher Education Bulletin, noted that "Dozens of private and regional-public colleges, for example, now offer degree programs in the Washington, DC, area. Wisconsin recently counted more than 100 out-of-state degree providers within its borders; there are 37 in Milwaukee alone." The 'financial support' argument is a bit hard to accept as well. Certainly, from some points of view, the level of support may seem small. Thus, for example, Gary Berg writes in an article for Education Policy Analysis Archives, "Clearly, with a proposed $6.1 million in the coming fiscal year for the UC, CSU and community college system, the California Virtual University is a small effort." And Dave Balch writes to an online learning list server, WWWDEV, "We are going (38 students the first semester, over 300 two years later) but still not the 'cash cow' the administration had hoped for." Even so, six million dollars is a lot of money. By any account, that is adequate funding. Additionally, since CVU does not actually create online courses - it only catalogues them - it has no design or delivery expenses. Under CVU, individual institutions design and deliver online courses. A number of member institutions received significant grants for online course development. So at first blush, the financial argument does not make sense. Even the university's failure on financial grounds does not seem to make sense. Why would Stanley A. Chodorow, CVU's first CEO, request a million in funding from the state's educational institutions? That seems a bit much for just a database. Clearly, CVU was never intended to be just a database. But what it was intended to be isn't as clear. The flag waving and hoopla surrounding each new phase of CVU promised more and more. Politicians and administrators said things like "We're aiming to be the Amazon.com of the technology-mediated education in California" (Rich Halberg, CVU's spokesman.)? Mid-1998 saw a number of glowing reports in the print media, such as A study in success: State's virtual 'university' graduates to a new level. On the web, CVU's earned an inexplicable 'five star' rating at Distance Education Review. It all seems to be a mish-mash. Some articles say that CVU would 'house' online courses, while others make it clear that it's merely an index. A number of articles played up CVU's 'Student Union' without noting that CVU has no students. The role of CVU in providing technology, support, or infrastructure was unclear. One of CVU's primary parameters was a partnership between industry and education. This was announced with great fanfare when it was launched. Sun Microsystems, Microsoft, Pacific Bell, KPMG Consulting, and International Thomson Publishing all contributed. But this venture was far from altruism on the companies' part. The companies would take over the schools' computer and telephone systems, and share profits from services such as computer support, pagers and Internet access." This plan immediately ran into controversy. The selection of the companies occurred without tender and behind closed doors. Other companies vied for a piece of the pie. Legislators questioned the wisdom of a 10 year lock-in. Academics and other staff criticized the plan, calling it the privatization of higher education. In April of 1998, Microsoft and Hughes pulled out. `The concerns are about the financial risk that the state's taking and who really winds up paying the freight for this -- is it primarily off-campus students? This is a deal that was negotiated without a competitively bid contract in private, and as people have begun to take a look at it and raise concerns it's become less attractive to the private sector partners to risk that much capital. CSU officials came up with the plan because the Legislature has not given the 325,000 student system the funds to provide state-of-the-art computer network connections. Students and professors have protested CETI (California Educational Technology Initiative), calling it the privatization of higher education. Other firms have complained that the four corporations would have a lock on future sales to CSU. The lawmakers voiced similar concerns about locking CSU into exclusive providers or one kind of technology. This reinforces the concepts from Christensen's excellent book Innovators dilemma: When New technologies Cause Great Firms to Fail, in which he argues that disruptive technologies must be allowed to incubate outside the realm of control and predation of the "mainline" business units. This would also explain Berg's assertion that "the present offerings of both the WGU and CVU... are not very impressive. In fact, they are little more than a hodgepodge catalogue of previously existing courses with great differences in format and quality." The initial Web-site launched by the CVU Design Team in mid-September has attracted more than 100,000 visitors in just over 60 days. Hundreds of prospective students, faculty and corporate partners have provided input by completing online surveys, and more than 1,500 people have requested regular e-mail updates on the project. Even if badly planned and presented, it still appears that online learning is a major draw. No, I think that CVUs problems had nothing to do with access, pedagogy, staff support, or even funding. CVU worked with a fundamentally flawed business plan from the beginning. No amount of rejigging would save it. By July of 1998, with new corporate support (Oracle) and a new site, CVU relaunched with plans to support itself through E-Commerce. It was doomed to failure. E-Commerce only works if people use the site and buy things from it. With each institution offering courses from separate sites, there is no natural nexus for students once they have started taking courses, no reason for them to return to the site. Hence the request for funding from the institutions, their sceptical reaction, and the downfall of the plan. What can online learning institutions learn from this? First: there is a great danger that online learning will suffer from the (uninformed) promises made by administrators and government officials. Expecting quick financial returns, expecting to be the provider of a certain course, program, or service, expecting that staff and students will flock unassisted to the new paradigm: these are all pitfalls into which promoters of online learning sometimes fall, and ironically, sometimes the discipline's greatest proponent can also be its greatest liability. The way to proceed in online learning is - ironically, given the nature of the internet - slowly and cautiously. The introduction of new technology must be, as David Jones says, a product of evolution. Pilot delivery and evaluation should be conducted before the announcements and promises are made. Staff should be acclimatized and trained in new technologies and methodologies (indeed, it is characteristic of CVU's approach that staff were left pleading for training). Second: corporate excursions into online learning will not be altruistic. Corporations are expecting specific returns. When they donate equipment or resources, they are expecting 'lock-in' - that is, a dependence on their technology. Moreover, they often desire to own the infrastructure, billing institutions for service (and leaving institutions to run the risk of passing those costs on to government or consumers). Where corporations venture into the provision of learning itself, their objectives will be based on profit, not social need. ...the core purpose of the university is to inculcate in its students an attitude of systematic scepticism. That is why true universities will always be safe from take-over by commercial interests and why 'for-profit' universities can never be true universities. Systematic scepticism and the academic mode of thinking make corporations and political bodies nervous, although individual business people and politicians may give heroic individual support to these ideals. But such a view should not resolve itself into complacency. 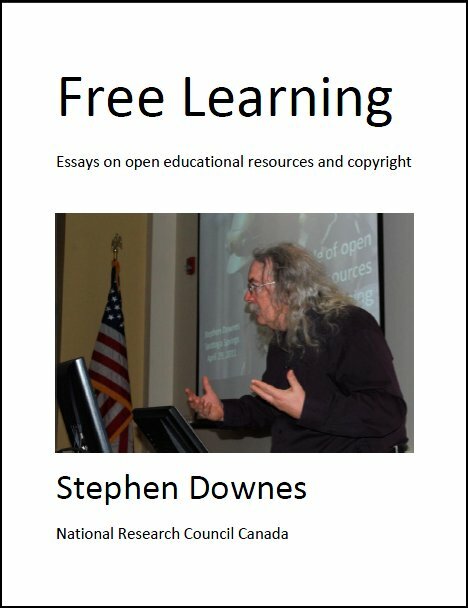 What Daniel is missing is the idea that a new model for learning will supersede the old, that traditional universities would not be acquired by corporations, but rather, they may be replaced by corporations. Third: joint ventures are necessary, because they reduce costs and improve usage. but joint ventures do not work unless the institutions work together, sacrificing (apparent short term) gain for future returns. Corporations know this, which is why they're willing to pony up the cash. Educational institutions do not, which is why they don't fund initiatives, protect their 'turf', and hence end up on the riskier side of online learning enterprises. The key lesson that you should derive from the story of the Open University is that we need university-wide technology strategies to take full advantage of the knowledge media. Letting individual faculty and departments do their own thing in the usual way will not deliver the goods. Why? Because a laisser-faire approach is likely to increase costs and create excessive differentiation that students will find burdensome. Universities now admit the need to increase productivity. Technology can raise productivity, but only by reorganizing the teaching-learning process to play to our strengths. And fourth: Colleges and Universities looking at online learning will have to understand that they are not looking at new ways of doing what they have always done, but rather, that they are looking at doing new things. Why would a student sign up with the CVU when they will get their degree from another institution? What is at issue here is that these virtual consortia are a sort of flawed concept and their failure does not represent a failure of distance education nor of institutions that are doing it well. For example, University of Maryland University College (UMUC) now has almost 200 courses on line and our distance enrollments are climbing at an incredible rate. We now have 15 undergraduate degrees and 7 graduate degrees completely on line and have over 12000 d.e. students. Half the world's population is now under 20. Our traditional concept of campus teaching will deny higher education to nearly all these youngsters. Yet providing them with education and training is not just a pressing issue for the countries concerned. This is a time bomb ticking under our collective security. Without vigorous action many of these young people will grow up to be unemployed, unconnected and unstable. In a global world that is a global problem. In order to address the changing needs of education, the emphasis on the professor will have to be shifted. Students will be expected to learn on their own, with the professor's guidance. This means that online materials will have to be, as they say in the field, 'learner centered'. As CPEC concluded in its 1996 report "Moving Forward," California needs more aggressive leadership in higher education. There appears to be widespread agreement among educational planners working on a regional basis that what California needs is leadership that moves public colleges and universities to a completely new paradigm that is student-centered (California Post-secondary Education Commission, 1996, p. 15). The California Virtual University clearly does not represent an instance of this kind of leadership. In the end, the structure of CVU may be likened to attaching a team of horses to eight freight cars and a caboose. It is not surprising such an effort would fail. It's not merely that horses are not strong enough or smart enough to pull the train. It's that such an effort fundamentally misses the point of the new technology. Online learning allows us not only to place texts and other materials on computer screens, and it does not only allow teachers and students better and cheaper modes of communication. It allows us to reshape learning, to do away with inefficient broadcast modes of teaching, and enter into an age of interactive learning. It's a hard paradigm to enter. Instructors will have to surrender their traditional monopoly on what is taught and when it is taught. Students will have to surrender the comfortable cloak of dependence. Administrators will have to rethink institutional jurisdiction and protected territories. Each must give up something - but each, if they follow that path, may gain so much more. Wired News Report: February 25, 1998. Technology is the Answer: What is the Question? Views Today: 0 Total: 371. Last Updated: Aug 20, 2018 3:57 p.m.